Kinryū-zan Sensō-ji is the oldest and one of the most important Buddhist temples in Tōkyō. A temple has been here since 645 CE, when the area had just small villages. That was long before the Edo castle was built in the 12th century. That eventually led to Edo, renamed Tōkyō, becoming the Imperial capital when the Meiji Restoration of 1867-1868 returned the Emperor to power. 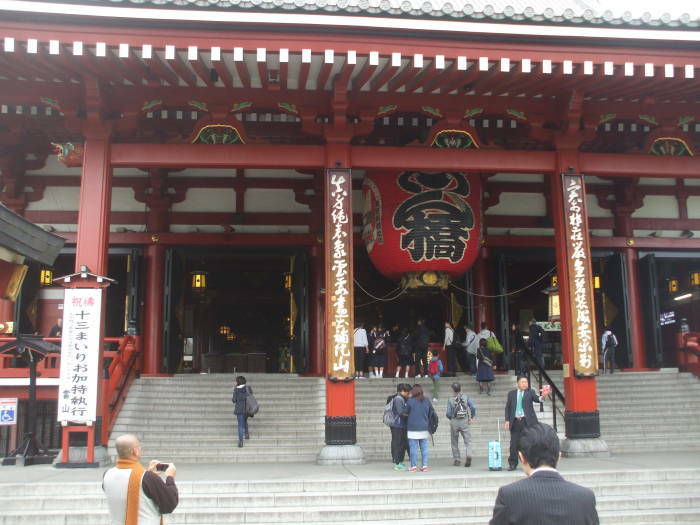 Sensō-ji is dedicated to the bodhisattva Kannon, and it is now the second-most-visited spiritual site in the world. Every year, almost 4 million pilgrims visit the Vatican, 5.5 million visit the Golden Temple of Amritsar, over 15 million visit Mecca, over 30 million visit Sensō-ji, and 45 to 55 million visit Sabarimala, a Hindu pilgrimage center in Kerala. Companies sponsor renovation and decoration, like these paper lanterns. The Tobu Railway and the nearby Rox shopping mall have paid for some of these. You step through Hōzōmon, the second gate, to face the temple. 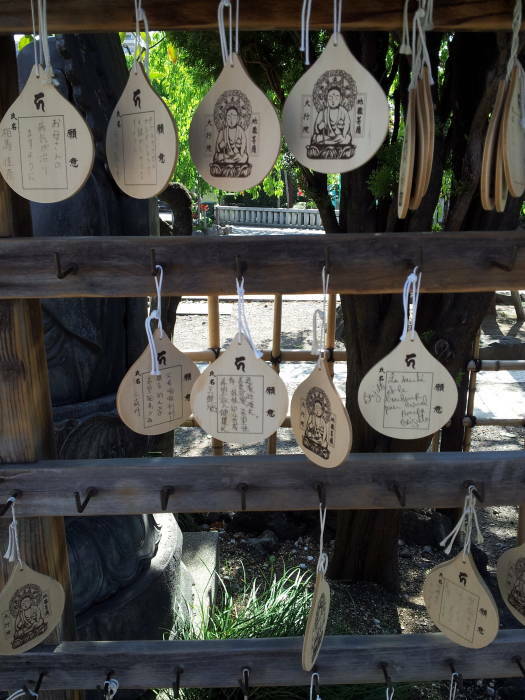 You pass between two buildings with counters selling prayer beads, charms, plaques on which you can write a prayer or wish and hang it near the temple, wooden slats on which you can write a prayer and have the monks burn it, and many other items. 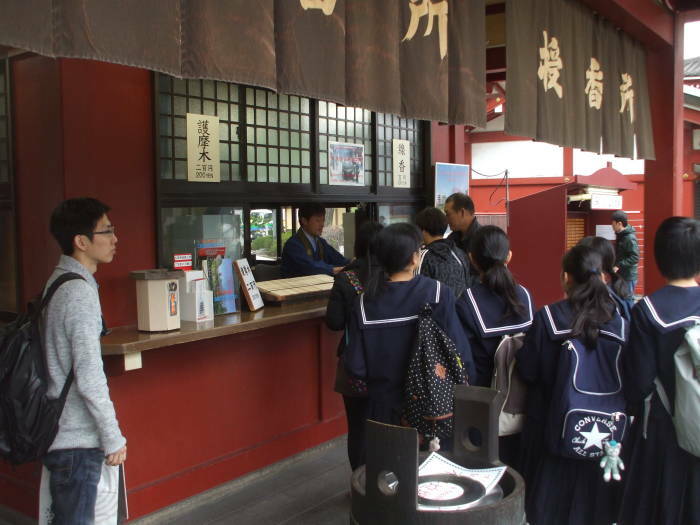 There are o-mikuji stalls. For ¥100 you may consult the oracle of the sticks. You shake sticks loose from a metal container, which direct you to one of a set of 100 drawers with slips of paper containing answers. If you like it, keep it, but if it's a bad fortune, tie to with all the others on the nearby batches. 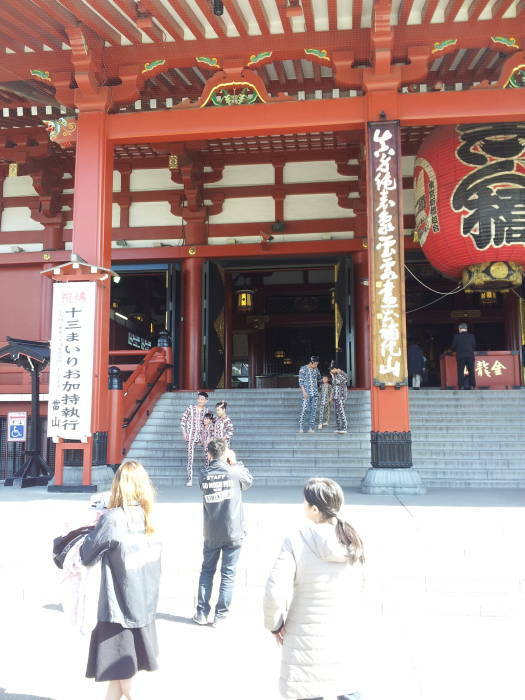 The belief is that the guardian deities of Sensō-ji will take over the bad fortune and protect you. The o-mikuji stalls at Sensō-ji have the reputation of having a high rate of bad fortunes. Well, sure, that makes people keep buying them until they finally get a good one. 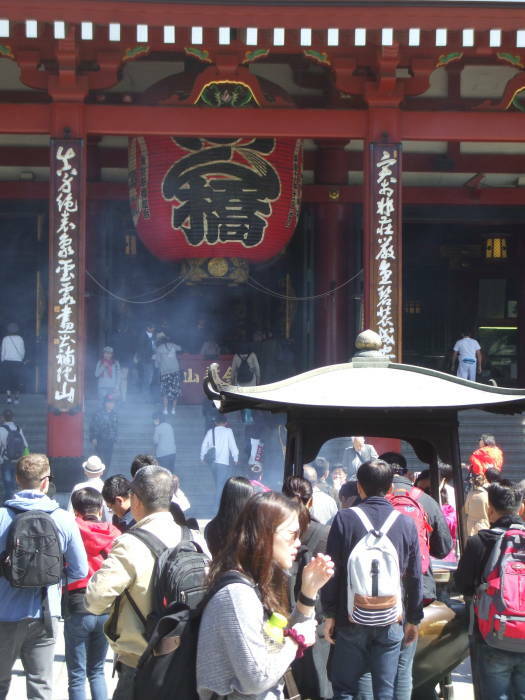 You can also buy incense, and we can already see the smoke rising from the large incense burner near the temple. 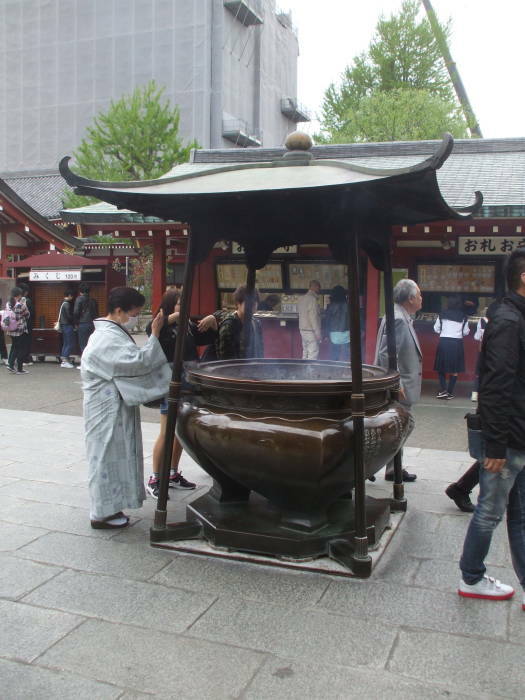 Jokoro, the main incense burner, is a large bronze vessel filled with sand and ash. You can buy a bundle of incense sticks, about 2 cm in diameter and 15 cm long, light the bundle, and stand it up in the burner. Everyone stops here to wave the cleansing smoke, "the breath of the gods", over their face and body. Incense burners were introduced from China at the end of the Sengoku Era, the feudal period that ended around 1600 CE. 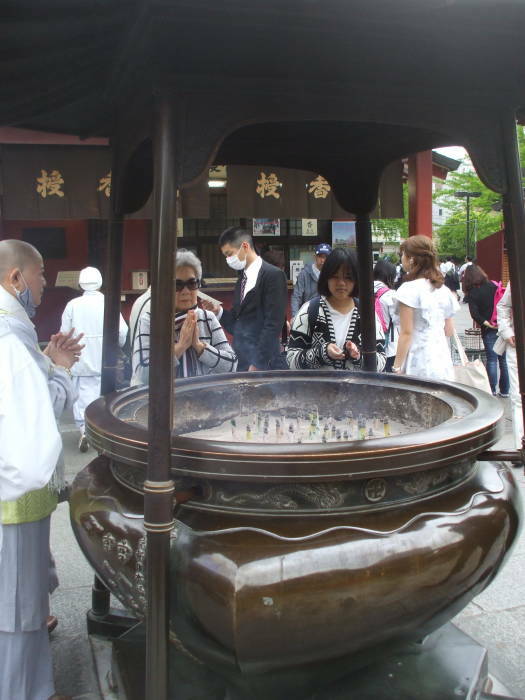 A small burner is used on a Buddhist altar to purify the bodies of people visiting the temple. Next, stop at the sheltered hand-washing basin. The shelter or pavilion is called the chozu-yakata. The basin itself is the tsukubai. That term is based on the verb tsukubau, meaning "to bow down", to humble yourself. Let's get clean! That's Ryushinzo, who rules over water, ruling over the fountain. There may be actual monks there setting an example of how it's done. When I was first there in mid-April, I heard almost no western visitors speaking English. There weren't many western visitors, and the few I overheard were mostly speaking French and Russian. 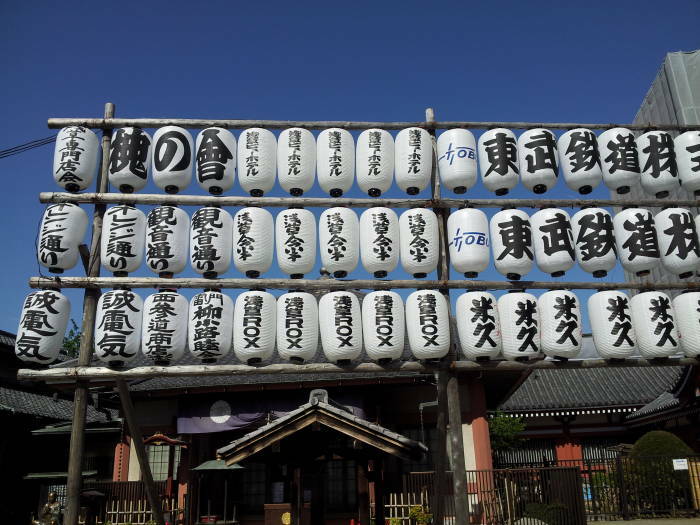 The small ema or votive plaques you see at major temples across Japan have writing in a variety of languages. Japanese but also Thai, Chinese, and Korean from East Asia. As for European languages, I saw more in English than in Russian, and almost none in French. So, from a Bayesian point of view, the small number of English speakers are individually far more likely than other nationalities to write wishes on votive plaques, and the numerous French-speaking visitors almost never do. The legend says that two brothers, Hinokuma Hamanari and Hinokuma Takenari, were fishing in the Sumida River one day in 628 CE. There was no Tōkyō, there was no Edo fortress, there were only small villages in the area. 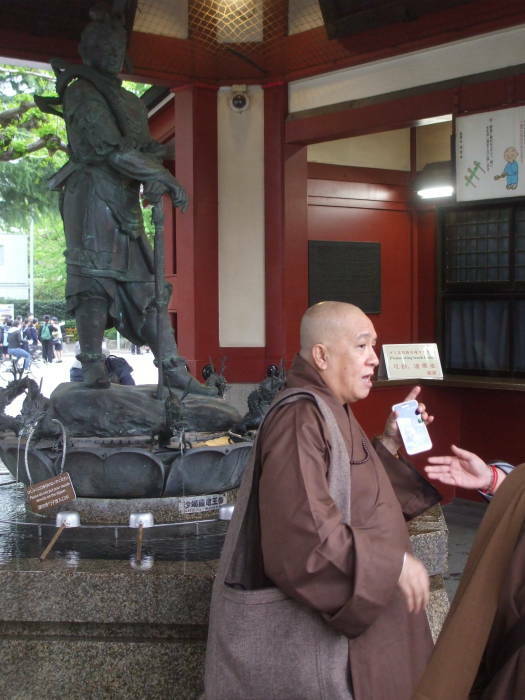 The two brothers found a statue of the bodhisattva Kannon. Bodhisattva is the Sanskrit term for a figure with great compassion, who strives for awakening, empathy, and compassion for the benefit of all sentient beings. A bodhisattva (or bosatsu in Japanese) is practically the same as an incarnation of the Buddha. But this enlightened being has vowed to first bring enlightenment to all sentient beings before themselves becoming a Buddha. The analogy for other faiths would be a being who could step directly into Heaven (e.g., Enoch and Elijah from the Jewish Bible, Mary in Roman Catholic and Orthodox tradition, Hercules in Hellenistic tradition, and several Hindu figures), but who chooses instead to remain in the world to bring enlightenment or otherwise help people. The original Buddhist figure represented by the statue was Avalokiteśvara, a bodhisattva who embodies the compassion of all Buddhas. Tibetan Buddhists believe that Avalokiteśvara, who they call Chenrézik, emanates as the Dalai Lama, the Karmapa, and other especially high lamas. Mahayana Buddhism and Tibetan Buddhism associate Avalokiteśvara with the mantra oṃ maṇi padme hūṃ. The Lotus Sutra or Saddharma Puṇḍarīka Sūtra was written in the first century BCE and the first and second centuries CE. Its 25th chapter contains the earliest teaching about the doctrines of Avalokiteśvara. It describes 33 different manifestations of Avakikiteśvara, both male and female. Sensō-ji's copy of the Lotus Sutra, stored in Hōzōmon, the inner gate, is designated a Japanese National Treasure. The concept and representation of Avalokiteśvara changed as Buddhism expanded north into China and then east to Japan. In China a slightly modified version of Avalokiteśvara is known as the goddess Guanyin. Despite being described as a goddess, Guanyin is often depicted as both female and male to demonstrate a limitless transcendence beyond gender. 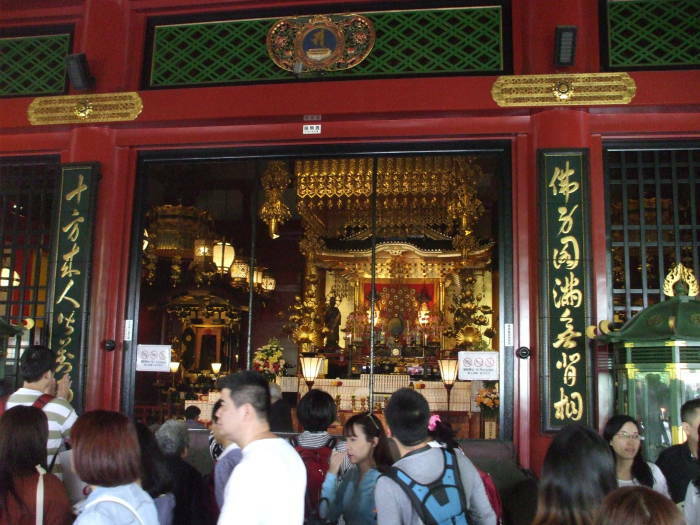 China transmitted Buddhism to Japan. The Chinese characters for "Guanyin" are pronounced in Japanese as Kannon. Canon, the manufacturer of cameras, printers, and other electronics, is named for the deity. Back to those two fishermen. 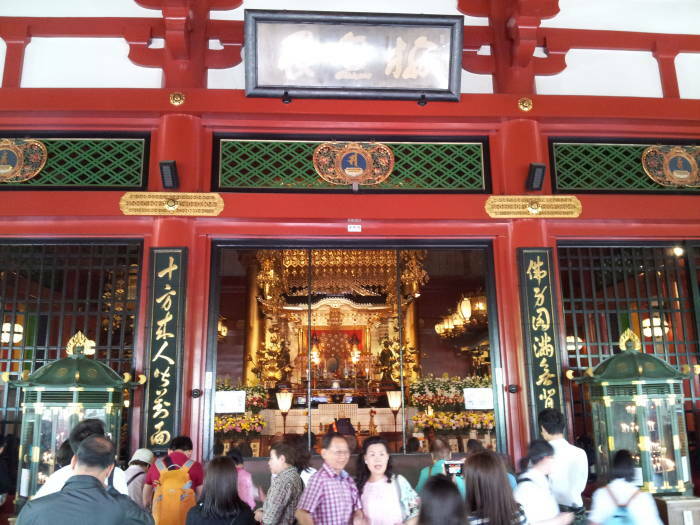 The legend says that they found a golden statue of Kannon, the goddess of mercy. It came up in their nets. They tried to get rid of it, but it kept coming back. So, they took it back to their village. This happened in 628 CE, when the Emperors were still buried in kofun, megalithic tombs covered by an earthen tumulus and usually surrounded by a keyhole-shaped moat. Buddhism had officially arrived in 552 CE, when monks from Korea visited the Japanese Emperor Kinmei. The Emperor sent an envoy to China in 607 to obtain more sutras. By 627, the year before the brothers found the statue of Kannon, there were 46 Buddhist temples in Japan, with 816 priests and 569 nuns. Buddhism wasn't a practial movement, it wasn't for the masses. Educated priests prayed for the prosperity of the Imperial house and the nation. Uneducated and unordained "people's priests" ministered to the common people. They practiced a combination of Daoist and Buddhist philosophy plus some local elements of shamanism. 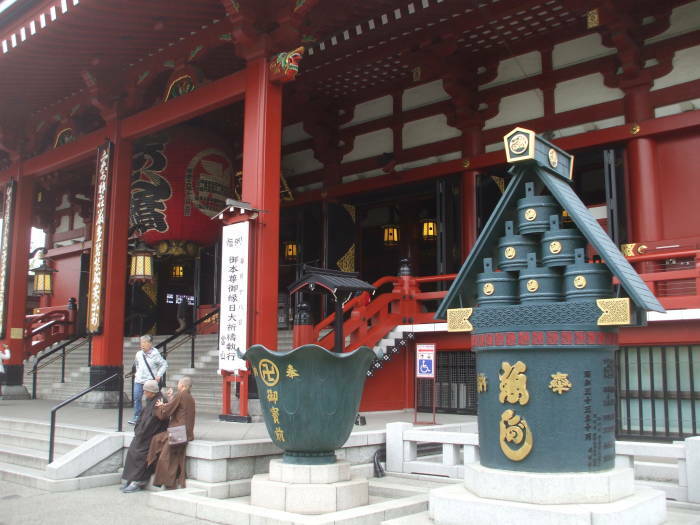 The brothers brought the statue home to their village, which now is the site of the Sensō-ji temple complex. Hajino Nakamoto, the chief of the village, recognized it as a holy statue. The story says that he delivered an impassioned sermon about the Buddha to the brothers, who immediately converted to Buddhism. He remodeled his home into a temple and enshrined the statue there, so the villagers could worship Kannon. The legend of the miraculous statue spread, and pilgrims including eminent Buddhist leaders began arriving from all over Japan. In the 10th and 11th centuries CE, warlords and samurai of the powerful Minamoto and Taira families began visiting. Taira no Kinmasa built the original outer gate and inner gate, the Kaminari-mon and Hōzō-mon. The temple prospered and declined over the years, until it became directly affiliated with Hiezan Enryakuji, the head temple of the Tendai sect of Buddhism outside Kyōto. 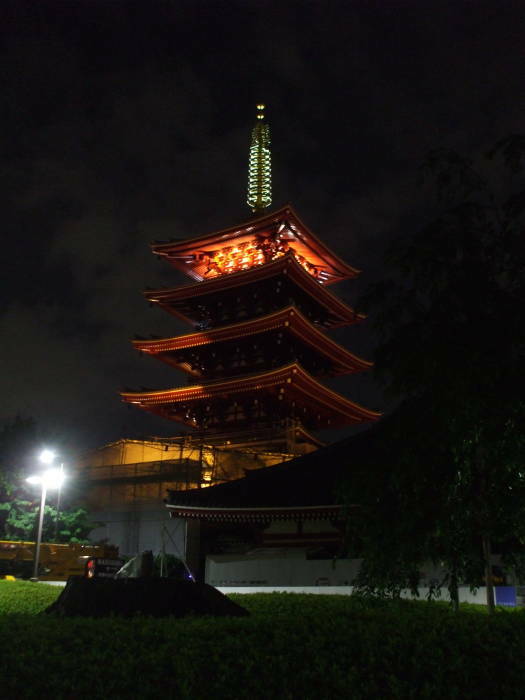 Sensō-ji remained affiliated with Tendai Buddhism, which was supported by the Imperial House of Japan and the Fujiwara clan. Tendai became politically and even militarily powerful. Tokugawa Ieyasu was the Shōgun of the early 1600s who created the great city of Edo (which was renamed Tōkyō in 1868 when the Emperor took power back from the Shōgunate). Ancient geomancy warned that invaders tend to come from the northeast or the southwest, the front and rear "demon gates". 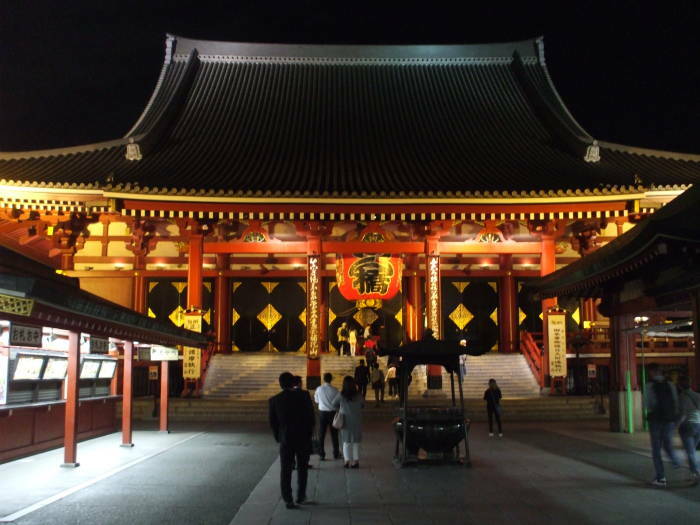 Sensō-ji was already 1,000 years old, and there it was in the northeast of Edo, ready to guard the front "demon gate" of the city. 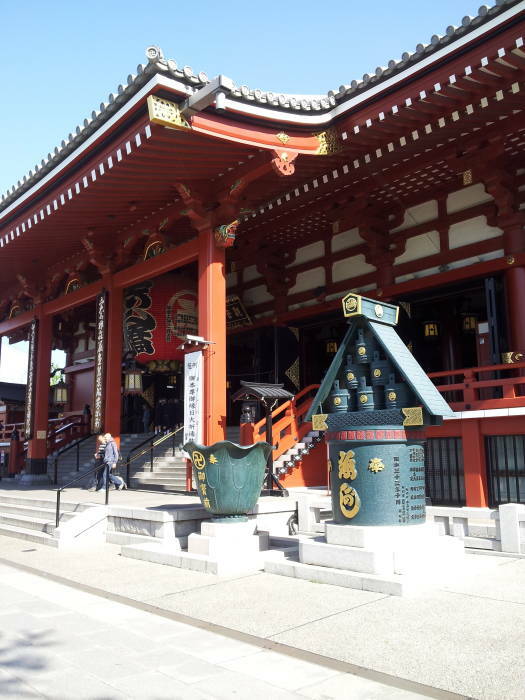 Ieyasu made Sensō-ji, along with Zojo-ji in Shiba, in the southwest, his family temples. 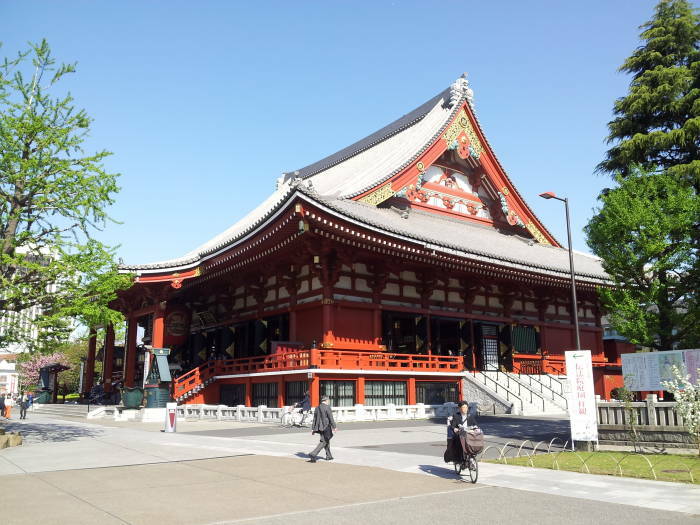 Tokugawa Ieyasu made Sensō-ji his family temple just long enough for everyone to see it as "the Shōgun's temple", and then he did it an even bigger favor by "decommissioning" it in 1625 CE. I suppose he felt he had the geomancy under control, or more likely that he was powerful enough to not have to worry about attacks from the northeastern front "demon gate". Now anyone could go to Sensō-ji without worrying about running into the dangerously powerful Shōgun. Then, in 1657 CE, the city's famous red-light district, Yoshiwara, near Nihonbashi, was destroyed by fire. 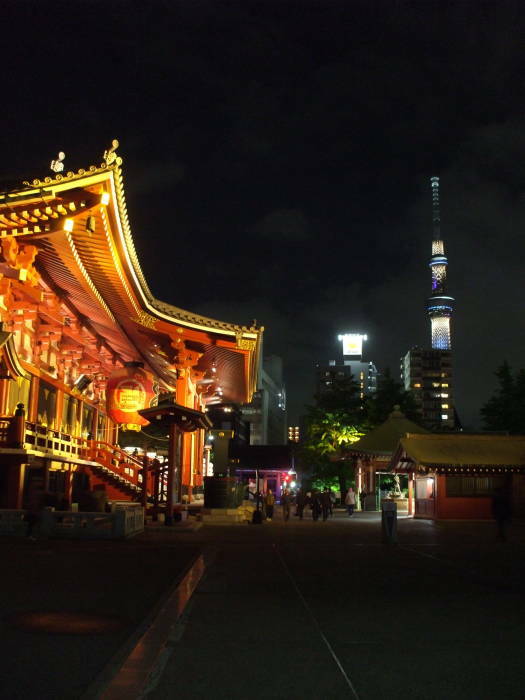 The city of Edo moved the red-light district to Asakusa. 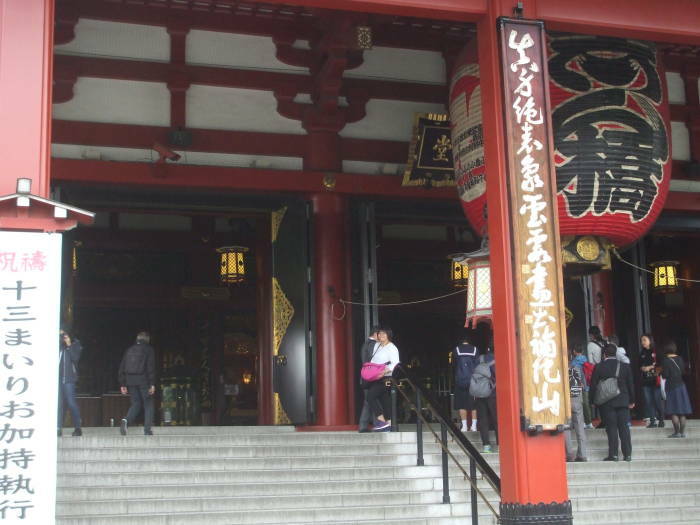 Asakusa was now the city's entertainment center. 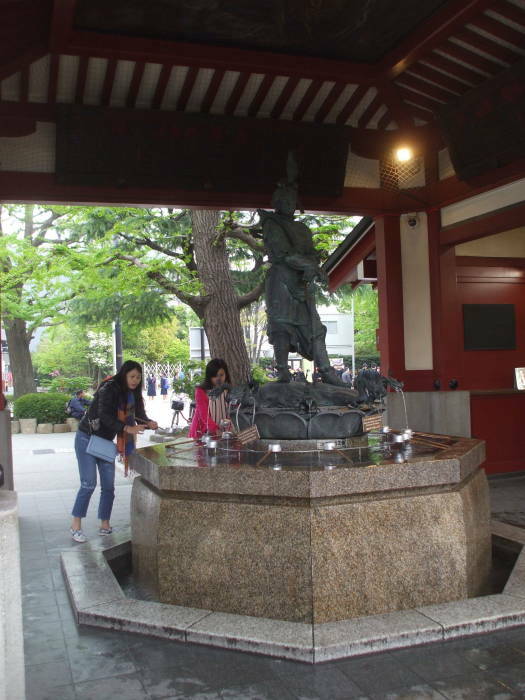 The third Tokugawa Shōsun, Ieyasu's grandson Iemitsu, built the first large temple structure. 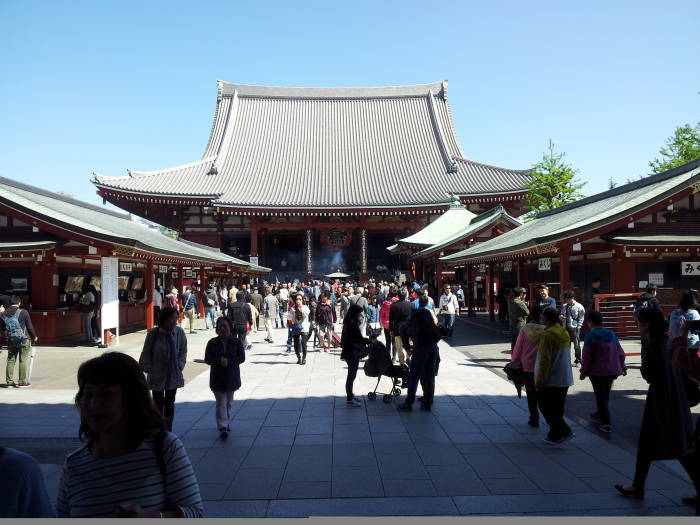 With the end of World War II in 1945, Sensō-ji became independent and now is simply the head temple of the Shō Kannon Bosatsu sect. The Hondō or Hon-dō is the main hall of a Buddhist temple. Or in the case of a temple to Kannon like this one, the Kannon-dō. 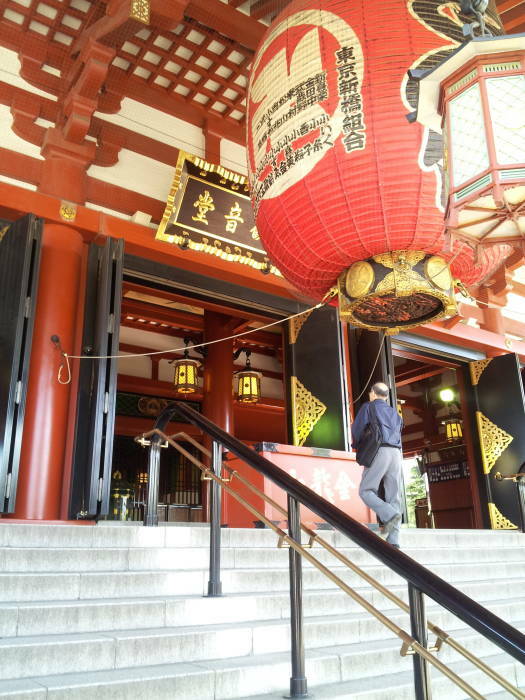 When I first arrived in Asakusa, severely jet-lagged, I came here daily for the 0630 chants. I had been awake since 0500 and there's not much else going on that early in the morning, even in this part of Tōkyō. The early morning services are very nice. In mid-April, things are still pretty calm through mid-day. A lot more people visit around mid-day, but they're largely locals who seem to be stopping by on a mid-morning or lunchtime break. They march right in, throw some coins into the large donation box, place their hands together in front of their chest and bow slightly or nod. Then before long, another bow and they leave. By the middle of May, things get crazy around mid-day. Mobs of people mill around, talking and taking pictures. Tour group leaders shout in attempts to organize their flocks. You can look at the architecture and the artwork, but the atmosphere isn't there. Visit the temple itself very early in the morning, for the 0630 chants. Then come back in the evening when the temple is closed but the grounds are open. Is the original statue here? 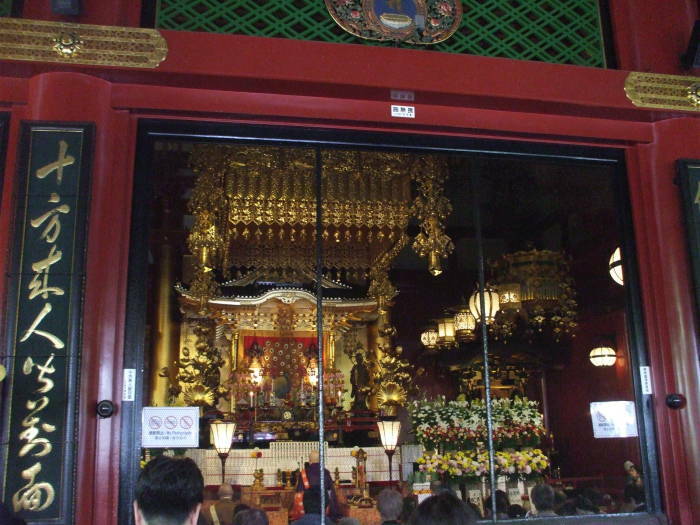 The story is that from the main hall you can see the gokūten or "august palace" beyond the altar, where the image of Kannon-sama is enshrined. The statue is a gohibutsu, a Buddhist image that is normally hidden from the public for, well, complicated reasons of Buddhist philosophy. Looking for the statue quickly becomes something like "I saw a guy who knows a guy who saw the statue once." It's back in there somewhere. When a monk or priest has worked their way up through the temple hierarchy, they may become one of the few keepers of the holy relic.